The nature of Top 40 radio in the 1990s was such that grunge music and new jack swing were practically next door neighbors. During a typical block of hits, a Nirvana track might easily be followed by a selection from Bell Biv Devoe or Keith Sweat. That was just the kind of freewheeling, everybody’s-invited era it was. So the idea of giving “Smells Like Teen Spirit” a new jack makeover is not as far-fetched as it initially seems. And that’s exactly what Pennsylvania musician aBillionKillograms did through his Soundcloud project, Sunday Guts. 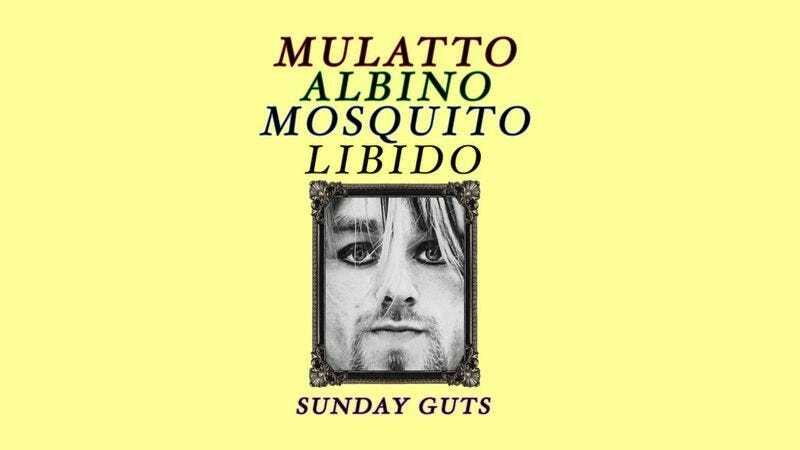 At that account, he has been dividing his material into two categories: “Serious Stuff” and “Fun Stuff.” Under the latter, one will find a track entitled “Mulatto/Albino/Mosquito/Libido” wherein Kurt Cobain’s original vocal is overlaid on a new jack backing track, complete with a rollicking bass line, dance-friendly drum hits, and wall-to-wall synths. Sorry, Dave Grohl and Krist Novoselic, but you’ve been given the night off. New jack swing, either for those who have forgotten or those too young to remember, was a high-energy form of R&B infused with hip-hop. It originated in the New York club scene of the late 1980s and early ’90s but then went mainstream and largely dominated the sound of popular music for several years. So pervasive was new jack that even extremely well-established artists like Janet and Michael Jackson experimented with the form. Nirvana never actually did, but that’s what the internet is for. The remixers of the world create alternate timelines in which anything could have happened. The Sunday Guts track was given a social media boost when this tweet appeared in the feed of video editor and satirist Vic Berger IV, himself a fellow Pennsylvanian.